Acute Coronary Syndrome; Coronary Vessels, Dissection; Fibromuscular Dysplasia. The incidence varies from 0.1%−0.28% in patients with ACS or sudden cardiac death.2,3 With the advent of coronary intravascular ultrasound (IVUS) and optical coherence tomography (OCT), a higher incidence of 4% has been reported.4 SCAD remains a poorly understood condition with no specific management guidelines. Figure 1: On presentation, the patient’s 12-lead electrocardiogram showed normal sinus rhythm with new T-wave inversions in leads V3-V6 and a biphasic T-wave in lead V2. Figure 2: Angiogram of the left anterior descending (LAD) coronary artery in the cranial projection showing a type 2 Spontaneous coronary artery dissection. (a) Acutely tapered segment in the distal LAD with reverse tapering towards the terminal end. (b) The same projection on an angiogram three months later showed complete resolution of the dissection with conservative management. 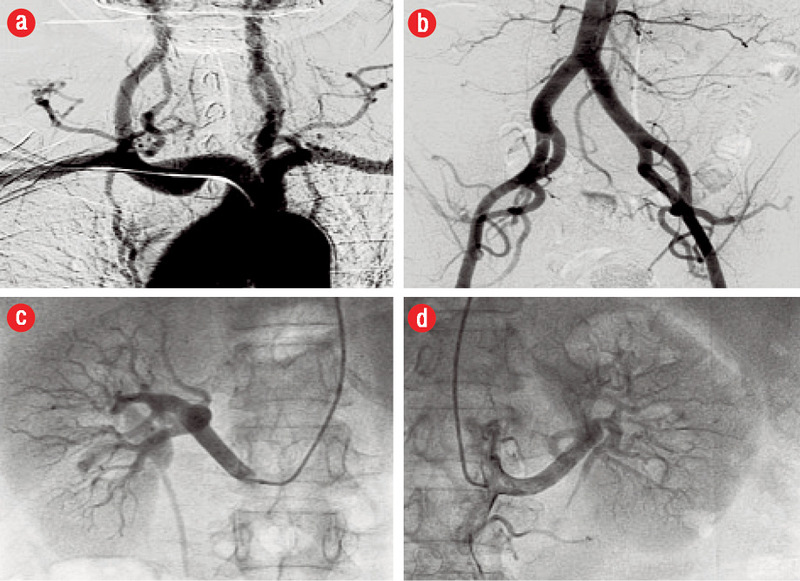 Figure 3: Angiographic surveillance for fibromuscular dysplasia (FMD). (a) Extracerebral head and neck arterial circulation, (b) distal aortic and iliofemoral arterial bed, (c) right renal, and (d) left renal arteries. The vessels were angiographically normal with no evidence of FMD. A 55-year-old diabetic and hypertensive woman presented to a tertiary care hospital with typical ischemic chest pain lasting for 30 minutes. The patient subsequently presented to the cardiology clinic at another institution for ongoing follow-up. She remained asymptomatic after discharge. An echocardiogram done at this time showed mild segmental left ventricular (LV) systolic dysfunction with mild anterior wall hypokinesis. There were no significant valvular lesions noted. She was advised to undergo a repeat coronary angiography to study the progression of LAD disease. An elective repeat coronary angiogram three months after the index event revealed angiographically smooth coronary arteries. The previously diseased distal LAD segment had completely healed, and the vessel had remodeled to its normal morphology [Figure 2]. Selective renal, aorta-iliac, and extracerebral carotid angiography showed no vascular abnormalities. In particular, there was no angiographic evidence of fibromuscular dysplasia (FMD) in the respective arterial beds [Figure 3]. Our patient had an ACS secondary to a non-atherosclerotic, non-FMD-related SCAD with complete resolution of the dissection with conservative medical management as documented on the control cineangiography three months after the index event. SCAD should be suspected in young patients presenting with ACS, especially in the absence of traditional atherogenic risk factors. The coronary cineangiogram should be carefully scrutinized for the subtle angiographic features characterizing the condition. Detecting SCAD has major bearings on acute management of such patients by deferring unwarranted and potentially hazardous pharmacological therapy and unnecessary invasive interventions. Care should be taken to tailor therapy to the case at hand given the lack of evidence to guide treatment with an emphasis on conservative management in stable patients. 1. Pretty HC. Dissecting aneurysm of coronary artery in a woman aged 42. BMJ 1931: Ruptupe/ Apri1:667. 2. Sultan A, Kreutz RP. Variations in Clinical Presentation, Risk Factors, Treatment, and Prognosis of Spontaneous Coronary Artery Dissection. J Invasive Cardiol 2015 Aug;27(8):363-369. 3. Hoye A. Spontaneous coronary artery dissection: time for a concerted effort to better understand this rare condition. J Invasive Cardiol 2010 May;22(5):229-230. 4. Nishiguchi T, Tanaka A, Ozaki Y, Taruya A, Fukuda S, Taguchi H, et al. Prevalence of spontaneous coronary artery dissection in patients with acute coronary syndrome. Eur Heart J Acute Cardiovasc Care 2013. Epub ahead of print. 5. Saw J. Coronary angiogram classification of spontaneous coronary artery dissection. Catheter Cardiovasc Interv 2014 Dec;84(7):1115-1122. 6. Saw J. Spontaneous coronary artery dissection. Can J Cardiol 2013 Sep;29(9):1027-1033. 7. Saw J, Ricci D, Starovoytov A, Fox R, Buller CE. Spontaneous coronary artery dissection: prevalence of predisposing conditions including fibromuscular dysplasia in a tertiary center cohort. JACC Cardiovasc Interv 2013 Jan;6(1):44-52. 8. Michelis KC, Olin JW, Kadian-Dodov D, d’Escamard V, Kovacic JC. 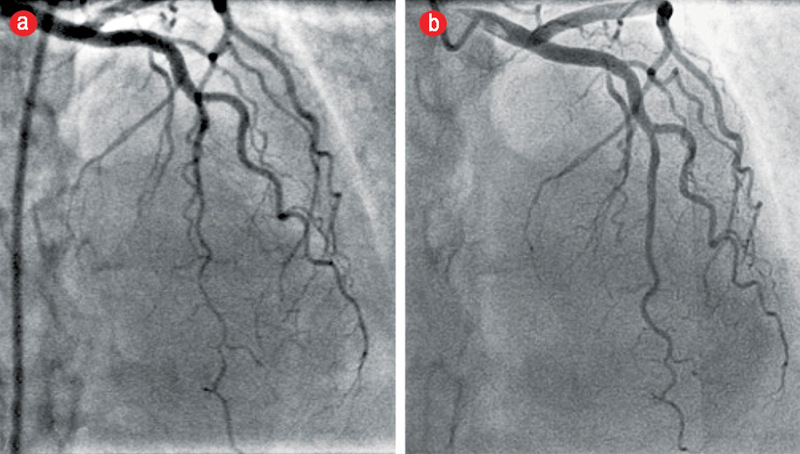 Coronary Artery Manifestations of Fibromuscular Dysplasia. Journal of t h e American college of Cardiology, 2014: 64(10); 1033-1046. 9. Saw J, Mancini GB, Humphries K, Fung A, Boone R, Starovoytov A, et al. Angiographic appearance of spontaneous coronary artery dissection with intramural hematoma proven on intracoronary imaging. Catheter Cardiovasc Interv 2016 Feb;87(2):E54-E61. 10. Alfonso F, Paulo M, Lennie V, Dutary J, Bernardo E, Jiménez-Quevedo P, et al. Spontaneous coronary artery dissection: long-term follow-up of a large series of patients prospectively managed with a “conservative” therapeutic strategy. JACC Cardiovasc Interv 2012 Oct;5(10):1062-1070. 11. Tweet MS, Eleid MF, Best PJ, Lennon RJ, Lerman A, Rihal CS, et al. Spontaneous coronary artery dissection: revascularization versus conservative therapy. Circ Cardiovasc Interv 2014 Dec;7(6):777-786. 12. Saw J, Aymong E, Sedlak T, Buller CE, Starovoytov A, Ricci D, et al. Spontaneous coronary artery dissection: association with predisposing arteriopathies and precipitating stressors and cardiovascular outcomes. Circ Cardiovasc Interv 2014 Oct;7(5):645-655. 13. Saw J, Mancini GB, Humphries KH. Contemporary Review on Spontaneous Coronary Artery Dissection. J Am Coll Cardiol 2016 Jul;68(3):297-312. 14. Olin JW, Froehlich J, Gu X, Bacharach JM, Eagle K, Gray BH, et al. The United States Registry for Fibromuscular Dysplasia: results in the first 447 patients. Circulation 2012 Jun;125(25):3182-3190. 15. Tweet MS, Hayes SN, Pitta SR, Simari RD, Lerman A, Lennon RJ, et al. Clinical features, management, and prognosis of spontaneous coronary artery dissection. Circulation 2012 Jul;126(5):579-588. 16. Eleid MF, Guddeti RR, Tweet MS, Lerman A, Singh M, Best PJ, et al. Coronary artery tortuosity in spontaneous coronary artery dissection: angiographic characteristics and clinical implications. Circ Cardiovasc Interv 2014 Oct;7(5):656-662.